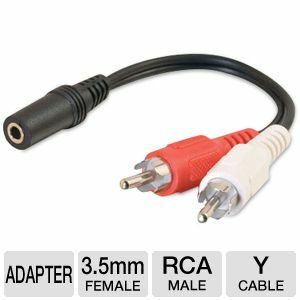 The Cables To Go 3.5mm Stereo Female to RCA Male Y-Cable is specially designed for use with receivers, televisions and hi-fi audio systems. Made with shielded dual conductor with 26 AWG and spiral-wrapped copper shielded wire, this cable is protected against EMI and RFI interference. The connectors are molded to provide excellent strain relief and feature brass and nickel-plated plugs for a solid and reliable connection. Order the Cables To Go 3.5mm Stereo Female to RCA Male Y-Cable now!